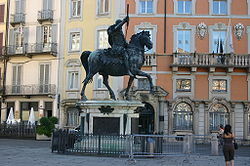 Francesco Mochi’s 1615 equestrian statue of Ranuccio II Farnese in the city’s main square, Piazza dei cavalli. Piacenza is a city in the region of Emilia-Romagna in Italy. It is the capital city of the province of Piacenza. 99,897 people live there. Piacenza is famous for its palazzi. Wikimedia Commons has media related to Piacenza. This page was last changed on 5 December 2018, at 19:45.